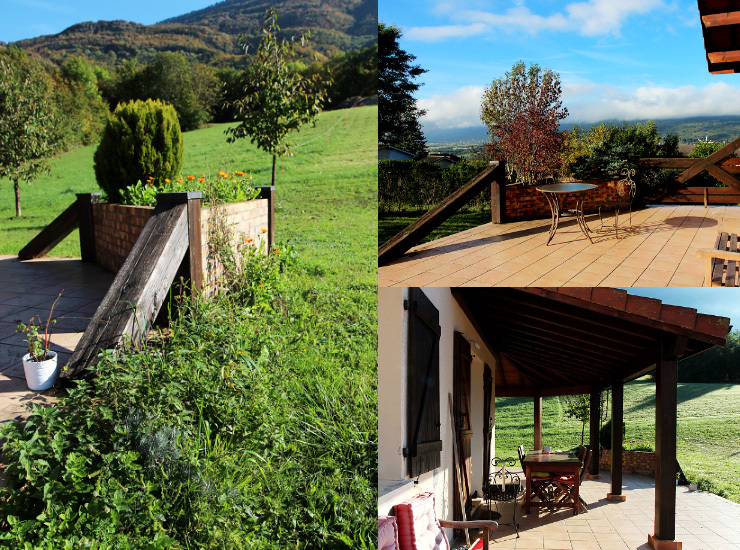 Can you imagine how lucky I am waking up every morning to this panoramic landscape? I must have done something right in the past or past life to have this kind of luck. Or my passion for food, wine and cheese has led me to this. Whatever the reason is it’s a bliss. Although it’s not sunny every day this time of the year, it has its own charm. When the rays of afternoon sun shine the plateau of Mt Jura, it feels like a paradise. Even the French say I’m more French than the French because I know more about cheese and wine than the ordinary French; they like drinking and eating them than knowing them. Also, my appetite for food is bigger than the French. I must look strange to the French, knowing so much about French food. Well, I’ve been in France on and off for the last 5 years, 1-3 months each time. I’ve tried most of the food and cheese. 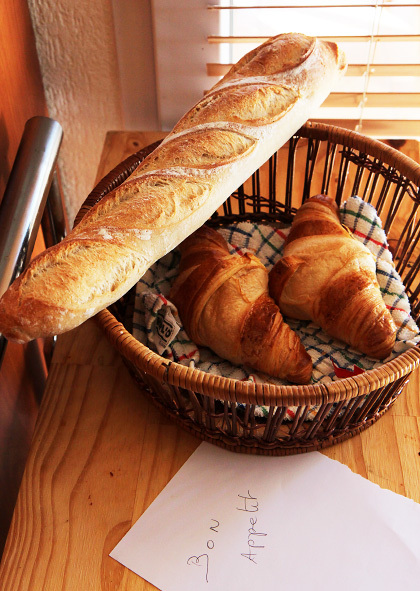 One of the great pleasures of French life is eating good fresh bread and croissants. But for the first time, the privilege of being surrounded by natural beauty is depriving me of the pleasure, which I look forward to the most prior to coming to France. The house is a bit far from the centre so I can’t get up and go to a boulangerie every morning. But the first week, my friend got fresh bread and baked the ready-to-bake croissants that come frozen, which were quite ok.
Getting bread is quite a mission here and last Sunday we couldn’t get any bread as everything is closed on Sundays. 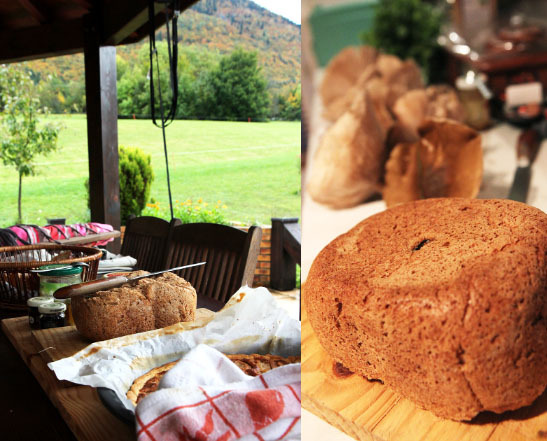 So my friend, ok, let’s call him Cyrille, made emergency bread just in time before dinner. 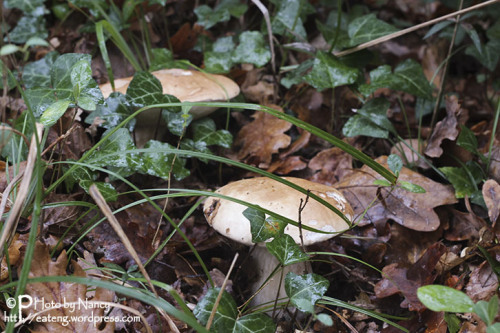 That day we went into the forest behind the house to pick mushrooms, which seems a must-to-do if you’re a French. 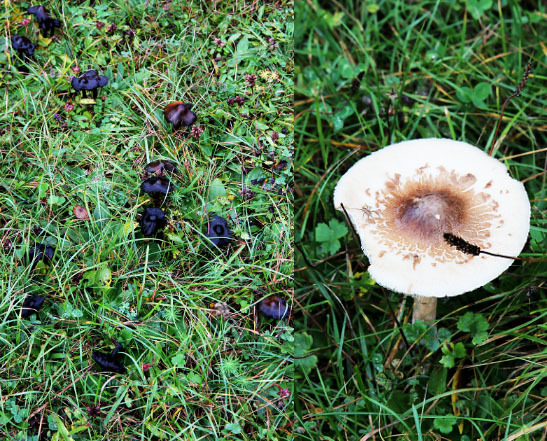 It’s my second experience of picking mushrooms in France. 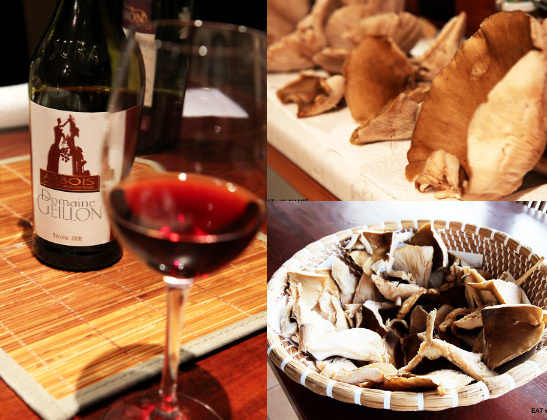 The first experience in Bordeaux, better known for mushrooms, was really fantastic. 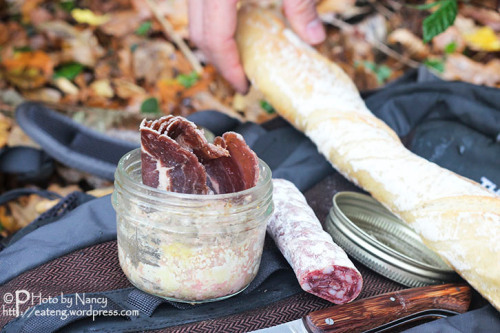 I remember the picnic with charcuterie including foie gras and baguette in the forest and the encounter with horses, and the cooking the mushrooms. I did it again. Well, we didn’t have to go far so it wasn’t much of an adventure except that we had to pick the right mushrooms. Cyrille had a reference book for mushrooms so he checked carefully for each one. There were some deadly mushrooms. Opps, how did we end up in a horse range? Uh oh… he’s running towards us. Oh, sorry, my horse friend. Please don’t get angry. 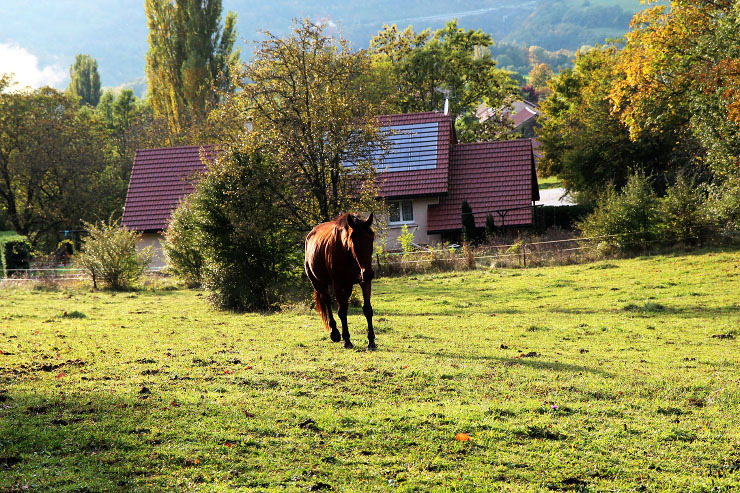 Worried that he might attack us for trespassing his territory, we backed away slowly, whie I hiding my fear and Cyrille trying to talk to the horse. The only type he was sure of was this so we picked two bags full and, still not 100% sure, he took them to a neighbour who was more knowledgable. 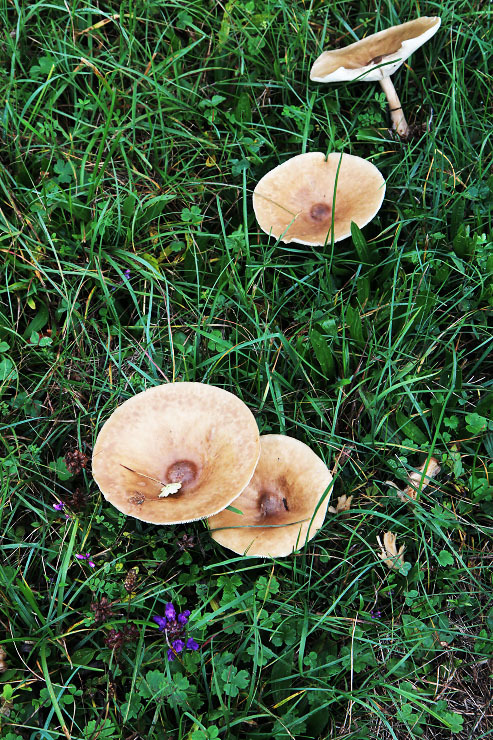 Upon entering his house, I saw a collection of mushrooms being dried on pieces of paper. A moment later he disappeared into a room and came back with a jar of dried black Morels! (wikipedia). I had a sniff at them and was struck by the pungent smell like truffles. Later at a grocery store I saw Morels selling at a ridiculously high price – I think it was €128/kg. The most common way to cook mushrooms is omelette, but Cyrille thought I could do something different with them and put me in charge. Well, actually I’ve been in charge of the kitchen since I got here except the first two days, and I can’t really complain about exploring recipes and cooking in the nice French kitchen. 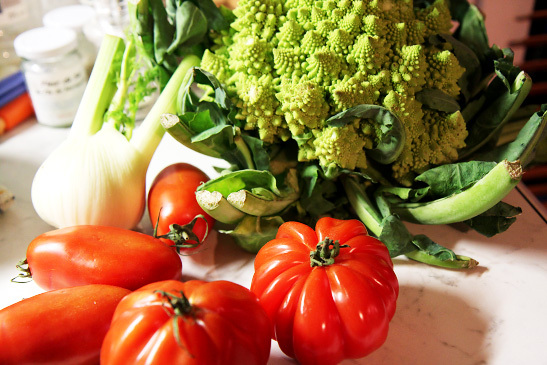 I had plenty of groceries I bought the day before, all the things I’d missed, fennel, rocket leaves, beef heart tomatoes, and the Romanesco broccoli, etc. I stared at all the ingredients, trying to get an inspiration, not just an omelette or grilled mushrooms with garlic. Ok, what about mushroom gratin with broccoli, rocket and goat cheese? It sounded good. So I started with the mushrooms first by pan-frying them with garlic and butter with a squeeze of lemon, and set them aside while preparing the vegetables. Since I wasn’t fully adapted to the new kitchen setting, it took a while to find right tools and ingredients. I could have used parmesan cheese but the only hard cheese was goat cheese in slices. I thought of using Bleu de Gex but I often think cooking with good cheese is a sin because I enjoy it so much as it is. Well, the improvised gratin was approved by my gourmet friend, Cyrille. I remember how critical he was of my food back in Sydney 4 years ago! Now it’s time for revenge, I reckon. The mushrooms were cooked perfectly and unlike the typical gratin, it was light and healthy. He seemed delighted by little surprises of lemon zest here and there, too. It could have been a tart but we both are on a low wheat diet and that’s why I chose a potato gratin. 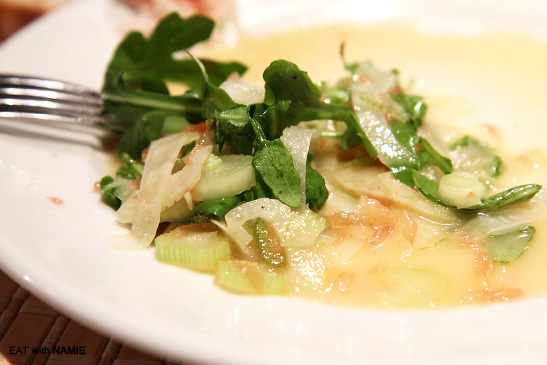 Oh, the fennel and rocket leaves…. I threw them together to make my favourite salad of Fennel Rocket Parmesan Salad, but without Parmesan, it had to be Fennel Rocket Grapefruit with Walnut Oil and Mustard Honey dressing, which impressed Cyrille to almost the point of victory. But a few more rounds to go till claiming the full victory. The salad was so tempting that I forgot to take photos but got one shot of the last mouthful of the salad for you. We drank a bottle of Jura Red, Domaine Geillon, Arbois 2008. It was my first Jura red and found it interesting. I haven’t tried Jura whites yet since I’m saving the thirst for the actual visits to the wineries next week. It was a pale ruby, low tannin wine and made mainly from the grape variety, Poulsard. I have to try more Jura wines to determine the characteristics. But I got a vague idea of what to expect from Jura wines. The wine, very pale in colour, floral on the nose, with the oxidised flavour, somewhat reminded me of some Greek wines I drank recently in Turkey. The low tannin made it a wonderful pairing for mushrooms and the old stinky cheese I had later. It was nice for experience and knowledge but it wasn’t the wine I’d buy for pleasure. Cyrille, despite being French, is discovering new cheeses each time. I couldn’t believe he hadn’t tried Chabichou du Poitou. It’s not a local cheese, but pretty well-known along with a better known Pouligny Saint-Pierre, which is one of my favourites. If you like aged, creamy goat cheese, then try the cheeses here (Charolais and Persillé de Tignes). 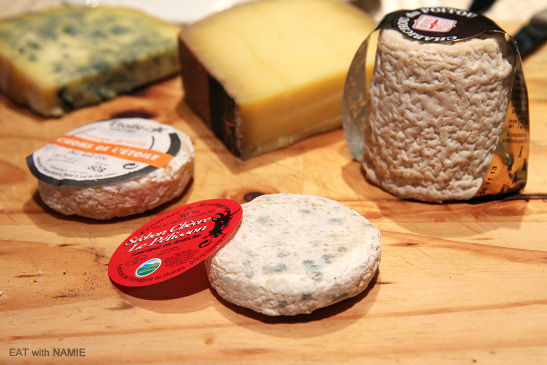 The little round cheeses, just mountain cheese, Séchon chèvre le Pélisson and Séchon de l‘Etoile, are the new local cheese I found in a supermarket, but here is more for cow’s milk cheese, not goat cheese. But I am expecting to find more at a farmer’s market and a bigger supermarket. The 800g of the first Comte piece is still visible on the cheese board, which we meet every day with new items added each day. The below is the recipe for the mushroom gratin but take it as a guide and create your own recipe, better and more interesting, because I cooked with eye measurement. I don’t know where measuring cups and spoons are in the kitchen yet. 1. Steam-cook the potatoes and broccolis slightly in a pot with little water and a pinch of salt for 5 mins, and let them cool. 2. Pan-grill the mushrooms over high heat with butter and garlic till the mushrooms lose most of the liquid. Turn off the heat, toss in lemon juice and cracked pepper and salt, and set it aside. 3. 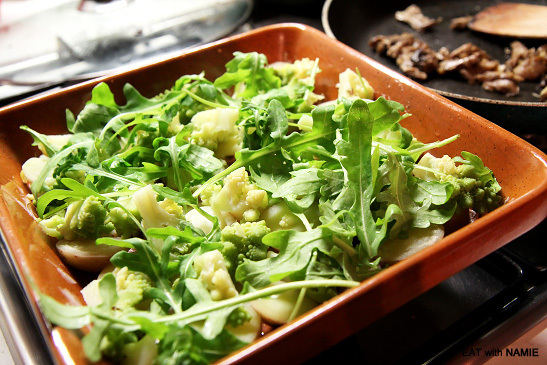 Brush the baking dish with butter and arrange the potato slices at the bottom, then the broccolis and rocket leaves, and finally, add the cooked mushrooms on top. 4. Whisk the eggs and cream with some grate cheese in the mixture, then pour it evenly over the dish and sprinkle some nutmeg and lemon zest before covering the top layer with cheese. 5. Bake it in the 190’C preheated oven for 40-45 mins. Toss the sliced fennel with a pinch of salt and a squeeze of grapefruit juice. Add in the grapfruit, the white pith removed, and the rocekt. Make the dressing and and toss in the salad mix before serving.